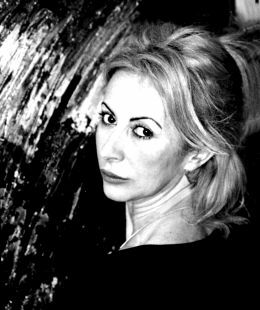 Vittoria Vanghelis was born in 1961 in Chiavari. After the School of Arts she graduated Architect in Turin, the town in which she shared the vanguard atmosphere. Then she lived for some years in Paris and in 1988 she settled in Milan where she made firm experiences as interior designer. Her working at the perception of volume joining expressive languages as well as at carefully searching among colours and materials, flow into parallel experiences that led Vittoria Vanghelis to the mass media world, in which she worked as art director. In 1993 she came back to Liguria. 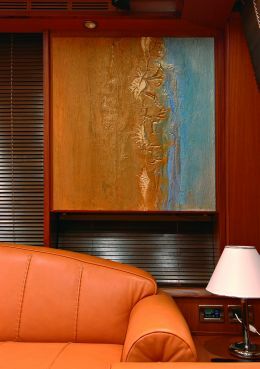 In 1998 she realized her first project of an integrating art for the Ferretti Group. This project also results in a continuous looking at the complex relations between Art and Architecture. Vittoria Vanghelis is a pain tress; what makes her job different, curious, fascinating is that she realizes installations exclusively on board luxurious Ferretti Group's yachts giving them a light touch of class already before they are exhibited at the greatest international boat - shows. After having artistically known her at the "Genoa International Boat Show" two years ago, we have been very pleasant to meet her at studio for deeply talking about joining art to yachting. Mrs Vanghelis, do you feel the Ferretti Group's artist? Of course, I feel so since when the idea of putting art in on board yachts was being talked about and I enthusiastically felt the Group was actually making the strategic choice of bringing art and yachting closer. 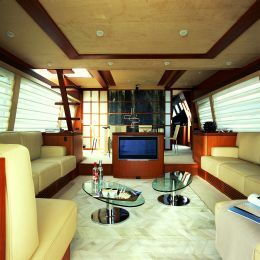 I felt very happy when this group proposed me working exclusively at interiors of yachts built by. As an artist I think I'm greatly lucky to have the opportunity of making a vanguard experience in joining art and yachting. What do you think about the union of art and yachting? Well, I think it's a very interesting reality indeed. Nowadays firms in various fields invest in art and the Ferretti Group has chosen to put in my installations on board its yachts. I think works of art on board are actually an expansion of the emotional interface between yard and owner despite of focusing the interest of lots yachting experts and lovers in. As an artist I want to underline the project joining art and enterprise is a cultural event that means not only business results but also emotional and symbolic involvement. What do you think about the idea of talking of art in a sea magazine? Well, I find this idea adequate and I think other such magazines will follow you in future. Three my installations will be first exhibit at the next "Genoa Boat Show": "Aria Magica" aboard Ferretti 731, "Domani" on board Ferretti 881, "Nel sogno" aboard Pershing 115. Moreover, I'm just intensively working at two installations for the Pershing 90 and Mochi 74 respectively. All in all you can verify how each yacht has its own, unmistakable soul easily distinguished by having unique works of art. 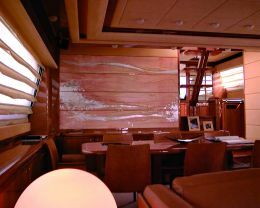 When was your first partnership with the Ferretti Group and from what the idea of applying art to yachting has come? 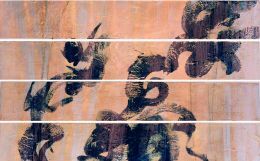 The project of realizing an integrated art started to be studied many years ago but it became reality early in 1999 by my first installation on board the Riva 80. I think the integrated art comes actually from aiming at relating two specific entities, namely a man with his both material and spiritual dimensions to his environment. In our case each installation is inseparable from the specific man and the specific space just because the three elements, installation - yacht - man, blend together. 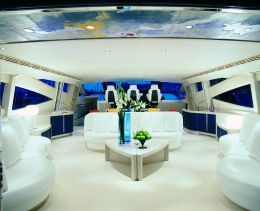 What actually happens when you enters a yacht not yet inhabited and think of an installation to realize for her? Well, first it's needed to found an adequate space for, working in team at renderings. The following step is a fully particularly personal experience in so far I feel an alchemist indeed when catching invisible elements, relating them to each others and joining them for giving life to something new becoming visible by manipulating matter and colours alchemically over whichever support and by following a ritually complex processing. This working at is carried out in part at studio in part at yard and only after installing ends the work of art is definitively fixed at the space dedicated to it. Indeed, I'd like to make it clear it's about going through a yacht's evolution from the project, over building, up to delivering her to an owner, who will inhabit her, rather than an extemporary working at. Building a yacht means an incredible work at in so far there's need for a great deal of people I usually meet in the various yards to be intellectively and manually involved in. Moreover, in as a magician place as a yard is, the craft manlike activity joins to new technologies used and this continuous process results in a never ending source of emotions and stimulus for my creating. How do you define these luxurious objects at whose interior you are usually called in to work at? 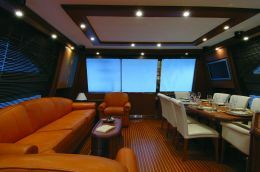 On board every installation is a light being just revealing the yacht's soul so different from the other ones. So a work of art opens a way, a window in the soul of each yacht that has previously met and collected passions of many people, starting from the first step, Norberto Ferretti up to me, the last (at least in the time sequence) one. I think an artist needs to have free valencies of staying a bit everywhere and a bit nowhere, when not perhaps fully in his own work. From the first step on a great deal of people work at realizing an unique project, a wonderful yacht that I would perhaps define a work of art . to be lived. Your working on board seems to be a propitiatory rite carried out with matter and colours suiting to a yacht whose destiny is always crossing seas under all incognita, isn't it? What do you think about? Well, I agree with. There are ancestral meanings beyond surfaces. When I hear someone say my paintings are beautiful, I feel glad, but this is only a partial reading of my job, it's only the visible face of it. Oil, earths, acrylics are the elements of, but two are the catalysers of my never ending alchemies: good and evil. Have you seen how many things have sprung out from talking about my working that doesn't give any holds for easy reading from neither figurative nor geometrical point of view: only matter, colours and spirit: namely an alchemy. I was pleasantly surprised by this meeting with Vittoria Vanghelis and her installations being on a level absolutely beyond all expectation. Above all what impressed me greatly was her quiet consciousness her job means, then as now, both work's continuity and seal of all people making these yachts great. Late in the night I left the pain tress in her house - studio, a delicious refuge where she welcomed me gently and spontaneously among great works not yet ended and many others already painted up hanging at walls. We greeted each other on a terrace looking like the aft deck of a yesteryear oriental ship and I went away walking on the tips of my toes because her thirteen year - daughter and the Persian cat had already fallen into Morpheus's arms . But the night will have been still giving Vittoria Vanghelis a lot of working time. 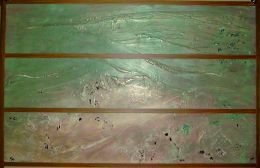 Although the pain tress is just intensively working at installations for the next "Genoa Boat Show" and has to go forth and back from her studio to various yards, you may find her soul in all those galleries and museums where she usually exhibits her works: among them we introduce here "Untitless" an oil picture showed at the "Galleria Gian Piero Biasutti" in Turin. 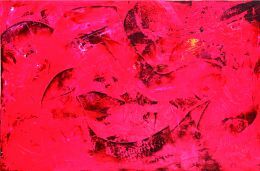 Other works of art are hanging now at walls of the "Novato Arte Contemporanea" Gallery in Fano, the "Biale Cerruti" located in Siena and Genoa. Till October her works are at "Museo di Arte Contemporanea Castello di Rivara" in Turin too. 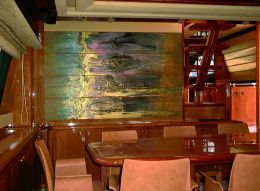 Confirming the preciousness of all her works we quote the 'site specific' "Dialogo con l'oro" hanging overall on board the 30 Custom Line wherry "Zia Canaia" reviewed by the art critic Maurizio Vanni.